This delightful book tells the story of ancient libraries from their very beginnings, when "books" were clay tablets and writing was a new phenomenon. Renowned classicist Lionel Casson takes us on a lively tour, from the royal libraries of the most ancient Near East, through the private and public libraries of Greece and Rome, down to the first Christian monastic libraries. To the founders of the first public libraries of the Greek world goes the credit for creating the prototype of today's library buildings and the science of organizing books in them. * What was the connection between the rise in education and literacy and the growth of libraries? * Who contributed to the early development of public libraries, especially the great library at Alexandria? * What did ancient libraries include in their holdings? * How did ancient libraries acquire books? * What was the nature of publishing in the Greek and Roman world? * How did different types of users (royalty, scholars, religious figures) and different kinds of "books" (tablets, scrolls, codices) affect library arrangements? * How did Christianity transform the nature of library holdings? 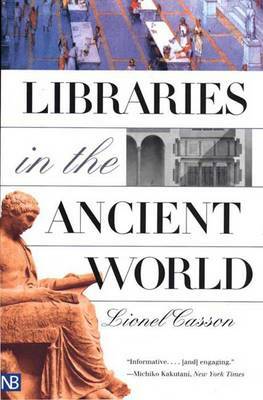 Just as a library yields unexpected treasures to a meandering browser, this entertaining book offers to its perusers the surprising history of the rise and development of ancient libraries-a fascinating story never told before.